Welcome 2015! I just realized that I can now say that I have been weaving for ‘decades’. 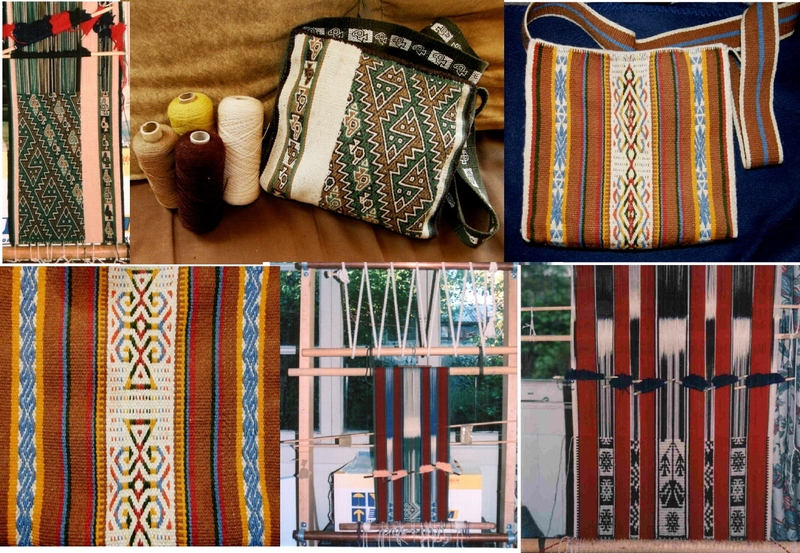 I have been weaving with a backstrap loom since 1996 but I started weaving with tablets and Navajo-style tapestry in 1995. Once again, I shout out a million thanks to Gladys Miller in Colorado who picked up this backpacker hobbling about on crutches in Grand Junction, Colorado back in 1995, took her to her home and then to the Navajo reservation to meet her teacher’s family, and sent her back to Chile armed with Navajo weaving tools, yarn, books and just enough know-how to get started. So, what am I doing on this first day of 2015 two decades down the track? I am sitting with pencil and ruler trying to figure out how to achieve just the right angle so I can split my newest weaving diagonally into two contrasting colored sections. I remember sitting and doing something similar back in 1995. 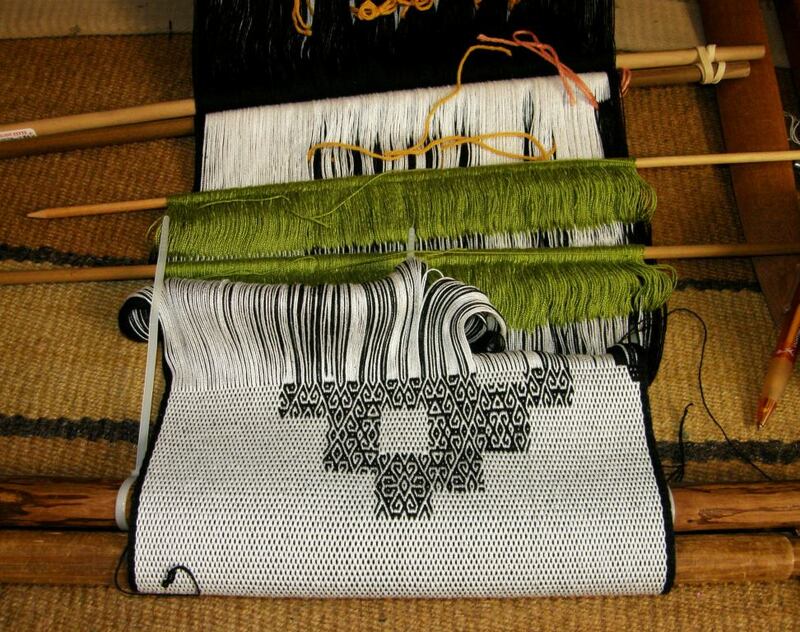 I was preparing to weave the tapestry piece at left on my Navajo loom in which I needed to have lines traveling at just the right angle so that they met up with others in just the right place. As I plugged away at my calculator, my boyfriend at that time asked me if that was how the Navajo weavers figured out their patterns! The piece was meant, believe it or not, to be red, black and white but there had been a mix up in my order from Wilde and Woolly in the US which had been brought down to Chile for me by a friend, and I got this pink-ish color instead. Apparently my red, black and white obsession goes way back. I spent the last couple of weeks of 2014 working on the ikat piece that I mentioned in my last post. I made a new frame on which to stretch the warp for applying the plastic ties and stood it up so I could be seated in front of it for tying. In past experiments I have had the frame lying flat, bending over it to tie, which was rather hard on the knees. The good ol’ simple wooden bed frame that I bought here in the street market has more than the one obvious use. It is the anchor of my backstrap loom and now also serves to hold my ikat frame. I wanted to tie some big block-like motifs to practice and improve my wrapping technique. What I really want to work on, once I am pleased with my wrapping, is circular shapes and odd angles. I want to create shapes with ikat which I can then fill with pick-up patterns… shapes beyond horizontals and verticals and angles that are fixed and determined by the structure of the weave. Before I get into that, I need to iron out some of the quirks of working with ikat tape and need to figure out the best way to handle wrapping long and large sections of warp. I am not there yet with this whole wrapping business. The dye seeped a lot in this experiment so much so that I didn’t even want to photograph the warp when I had removed the ikat wraps. It was a bummer! This would have looked awful if I had woven it off in plain weave. However, I used Andean Pebble Weave in the un-dyed sections and somehow the staining that resulted from the seeping dye is barely noticeable amongst the two and three-span warp floats and hardly shows up in the pictures of the finished piece. It’s there, believe me. 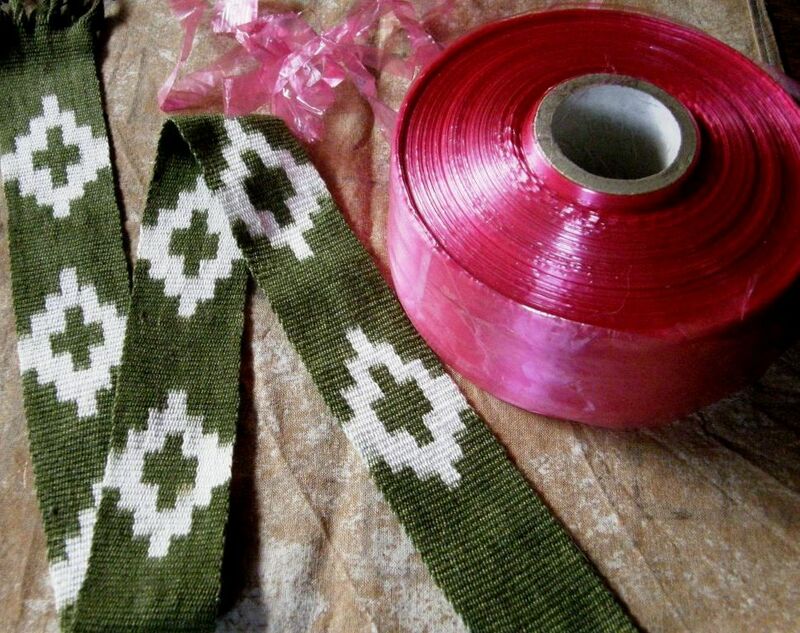 As for the ikat tape, I was given enough for a lifetime, as you can see, by my friend Betty. Someone was asking about places to buy it in one of the forums and a link to a source was provided by one of the members and is much appreciated. I used to use cassette tape and like the fact that it is opaque. I used cassette tape on the green band at left. The advantage of the ikat tape is that it is very wide and tears beautifully into perfectly straight strips of any width you like. Now I am wondering how I can ‘work with the quirk’, so to speak. I am thinking that seepage at the edges of the wraps and the resulting staining could give an interesting effect, as if the design that I weave within is emerging from a mist….soft and blurred at the edges and moving gradually into focus….hmmmm….I have some ideas about that. 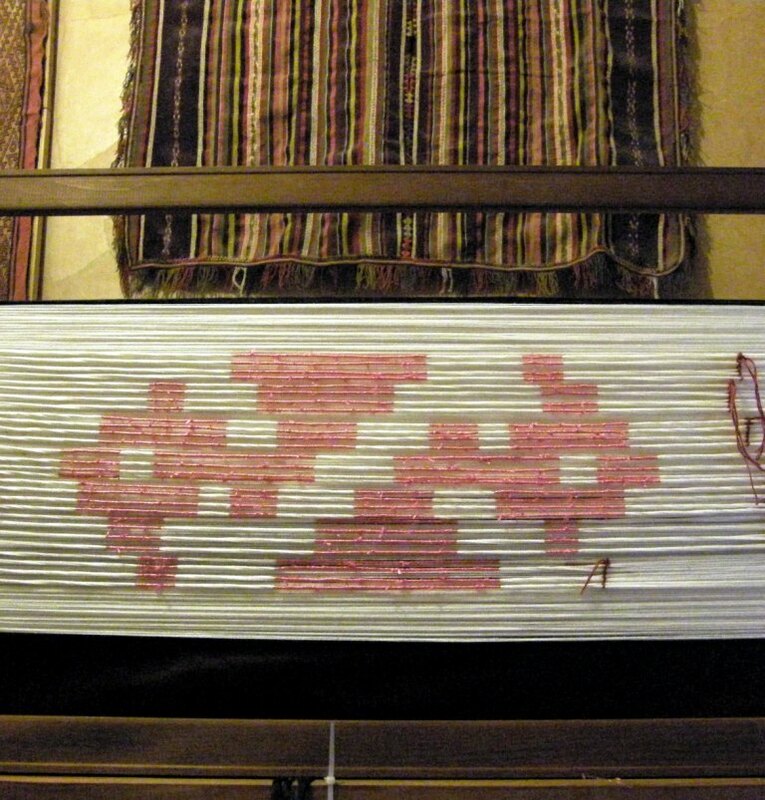 I edged the horizontals with a cross-knit loop stitch as the typical blurriness of misaligned warps at the edges of ikat motifs, that is so beautiful in plain weave, is not so nice when you are working with two and three-span warp floats. While I really don’t have that much difficulty doing pick-up in black, sewing black on black was a killer! I am lucky in that I don’t yet need glasses for reading and other close work. I figure I should do this stuff while I still have the eyes for it! So, I am supposed to be moving on to another ikat project but…. I got distracted. I was so pleased with the bird pieces that I decided to do a series of birds. I don’t need to do ikat to be able to create these large block-like shapes and so I warped up for Andean Pebble Weave and started another double bird motif. You can see the spotty pebbled look in the white background. The pick-up design looks rather crazy and confused right now. Hopefully it will start to make more sense when I get to a wider section where the various small scattered elements can come together. 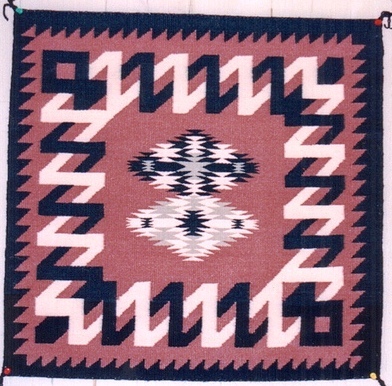 I want to create the same bird motif as on my ikat piece but split the two birds diagonally. That way, I will have white pebble pattern on black on a white background for one bird and then the reverse for the second bird. And that’s where the pencil and the figuring that I mentioned earlier comes into play. The Andean Pebble Weave structure gives me diagonals that are too steep to divide the birds smoothly and so I have to come up with a stepped diagonal instead at just the right angle. 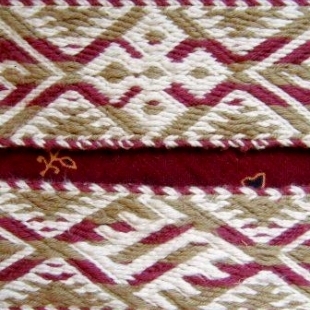 I sewed a line between the two birds on the ikat piece, which I will remove later, to help me figure this out. So, there will be three pieces in this series. I will have one bird piece that is all solid black with a black on white motif….that’s the ikat one that I have just about finished. The second, that I have just started, will be pebbly and half black, half white. The the third will be another ikat one in solid white with a white on black motif….basically, the opposite of the first. This third piece will be the big challenge as I will have to put ikat ties all over a white warp leaving only the bird motif exposed to the black dye. Textiles that have been created this way, with larger wrapped areas than unwrapped, have always boggled my mind even more so than other kinds of ikat I have seen…all that tying! 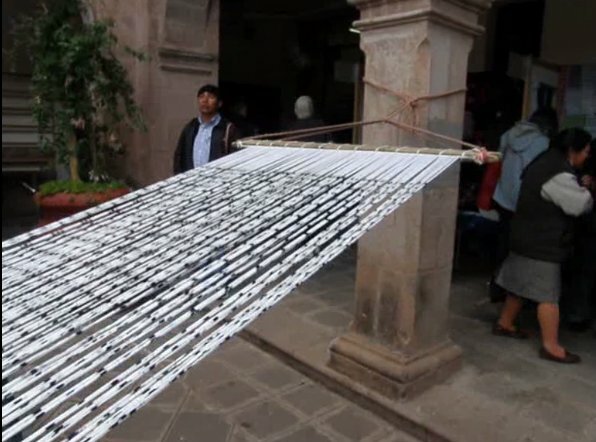 In the above piece from Tacabamba, Peru, I am guessing that most of that white warp was wrapped to expose a multitude of tiny spots to the indigo dye. You can see the shawl weaver with the many mostly white shawls on display behind her. I think the bird series will be interesting and I am excited about it. I hope I can make it work! Then I will get back to those circular ikat shapes and now have time to think about just what kind of interesting shape to fill with pick-up patterns. So, a second decade of weaving closes and a third begins. It is fun to look back at the beginnings, although, sadly, I wasn’t as camera-happy back then as I am now and I have little show for it. Lots of things had to get left behind in Chile. 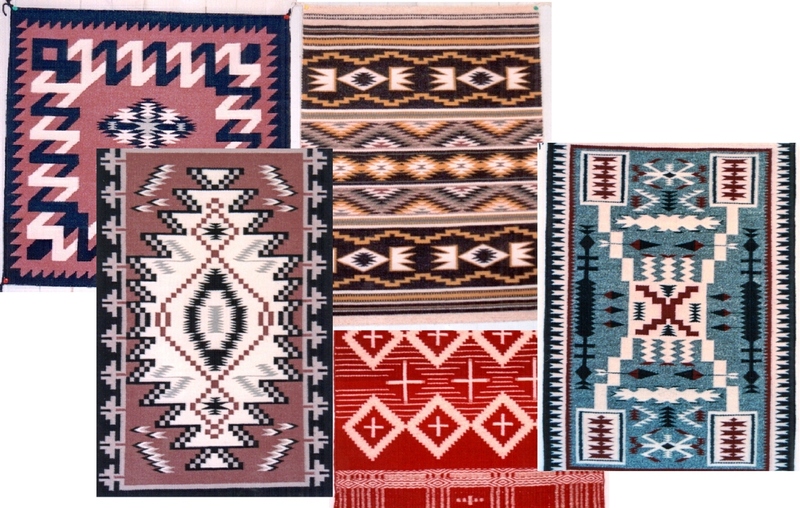 At left, is one of the tablet weavings I made while I was waiting for my Navajo loom to be built back in 1995. The rest stayed in Chile when I moved to Bolivia. I like the red and green. I had no idea about any kind of clever way to set this up. I had one end of the warp tied to the leg of the desk in the corner. The warp went over the double bed and was tied to the door knob at the other end of the room. I wove and wove starting standing at the door, and then moving across the bed while adjusting for take-up. I made some samples and a strap for my boyfriend’s binoculars and that was that. Finally, the Navajo loom was made in time for my birthday in 1995, and I threw myself into that for a while until that order of Wild and Woolly yarn ran out and there was no one to bring me more. I dyed all my left over scraps red for the bottom piece to use up just about everything. You can see all the different tones of red I got from having over-dyed so many different colors. And then I went off to Peru in 1996 for that first learning experience with Peruvian backstrap weavers. Below, is the first thing I made when I got back. It was the worst warp ever wound! The stakes leaned inward terribly but I managed to angle the far loom bar and somehow compensate. 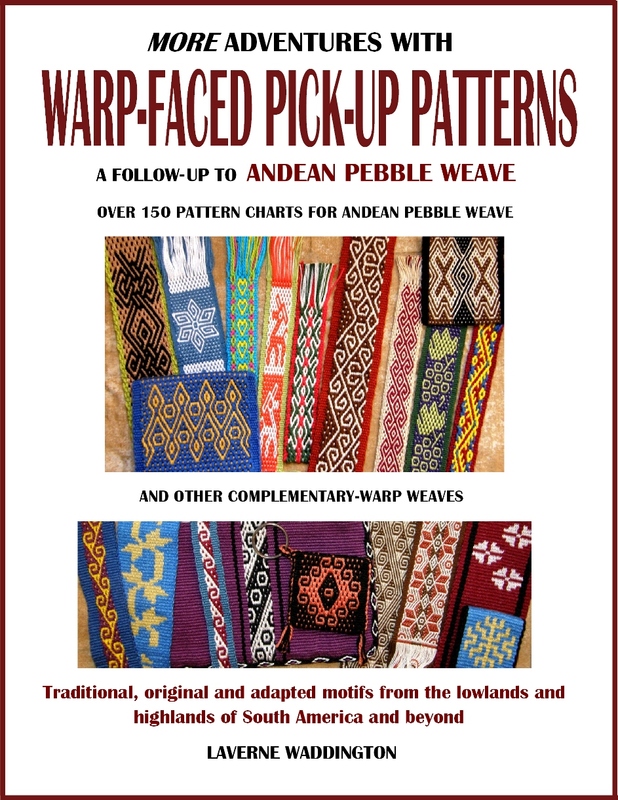 I combined the two structures that I had studied with my Peruvian teachers…Andean Pebble Weave and supplementary-warp…it seems that I had a thing for red and green in those days. 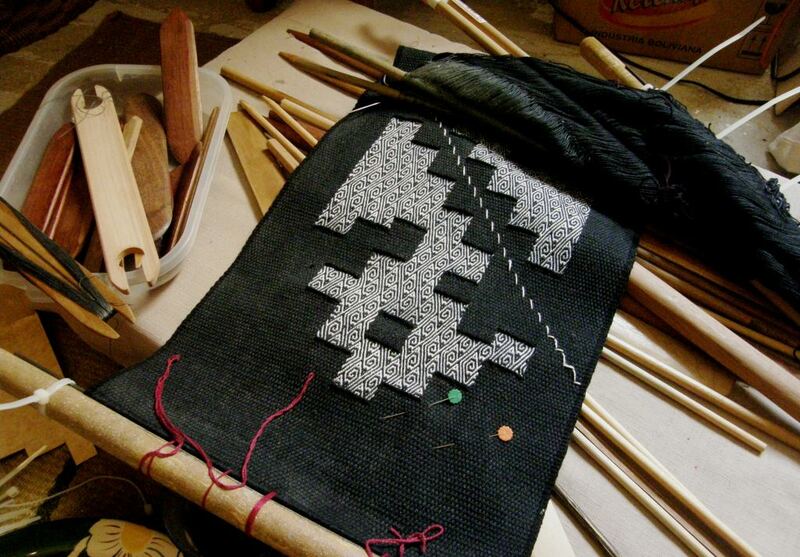 The Navajo loom had to be left behind when I moved to Bolivia in 1998 but my backstrap sticks and tools came with me. And now, 20 years on, the loom remains the same, it is all still so very exciting and I struggle to keep up with my ideas. I have come by a few more sticks, a shuttle or two, some swords and reeds. As for the tablet-weaving, I am happy to watch my weaving friend Cheryl’s adventures in this new-to-her technique and hope to be able to show you some of her work soon. 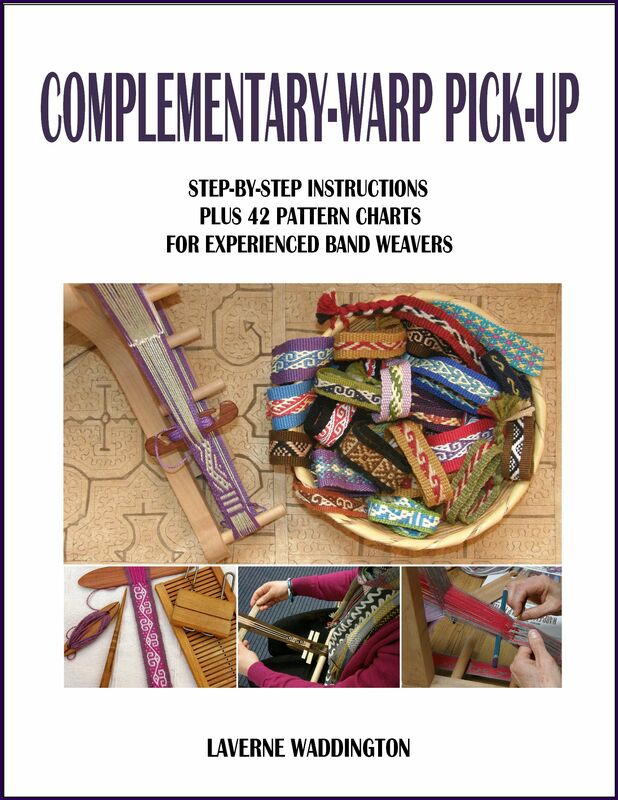 I look forward to a wonderful new weaving decade and wish you all a Happy New Year. Thank you, Virginia. Happy New Year and hope to see you next Fall if not before. You were on Santa Fe? Any chance of another visit here? I am in Albuquerque. Although you are a weaver and I am a knitter, I see similarities in our work, pushing the boundaries of the techniques and finding inspiration in ethnic textiles. 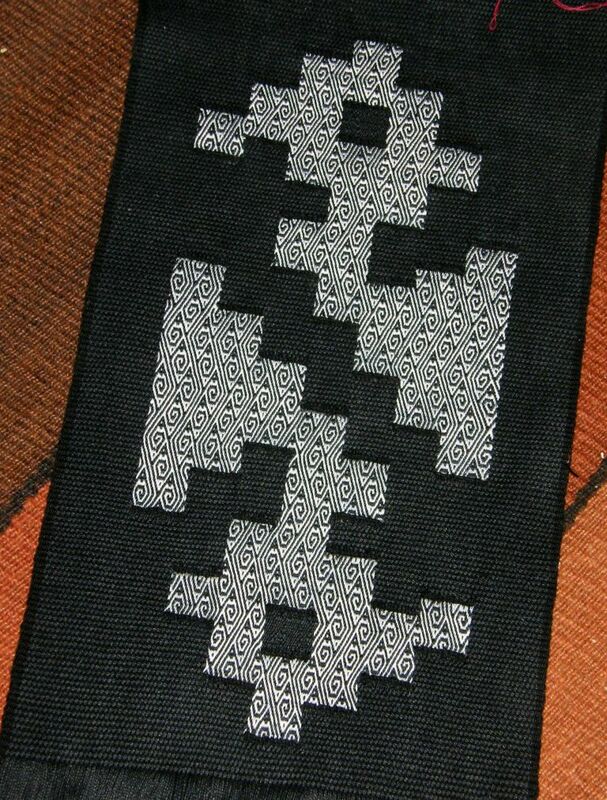 Some of your motifs are inspiring my current sweater design, based on Anatolian tribal designs. A good weaving friend of mine just moved to the Albuquerque area, Celeste so, who knows, I might be there one day.It would be great to meet you. The designs on your sweater must be gorgeous! love that entry, enjoyed seeing your Navajo Phase, Happy new Year my dear friend, here is for many new projects, inspirations and lots of curiosity. you are a gem !!!! Sending you big hugs, Yonat! 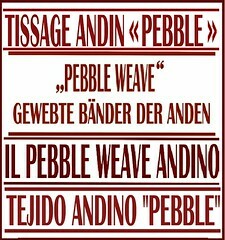 Hi Laverne, I marvel to see the Navaho style weavings you did so long ago and the ones integrating your newly learned Peruvian pebble weave (using multiple heddles across the piece to achieve a wide warp face weave on a Navaho loom?!) 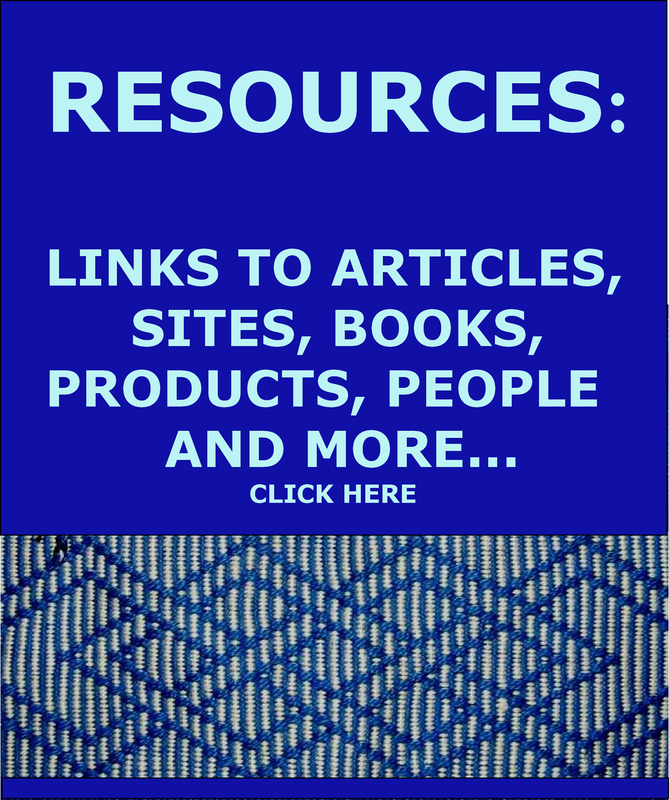 Watching from the sidelines of this blog, you hardly seem to be one who dabbles at the edge of your interest–no way. You must soak up and incubate design ideas while you are on the road and can’t weave, then when you get back you become an inspired weaving dervish! When you are seized by an idea these days, you don’t just sample endlessly but emerge with plans for a whole series of compositions that have something to say by their relationship and proximity. I can see it takes decades of experience and sampling to get to that place where you can not only conceive of, but plan what you will do with a new technique, even one you haven’t fully mastered yet….because you have the confidence that you will work out the kinks, as you say. 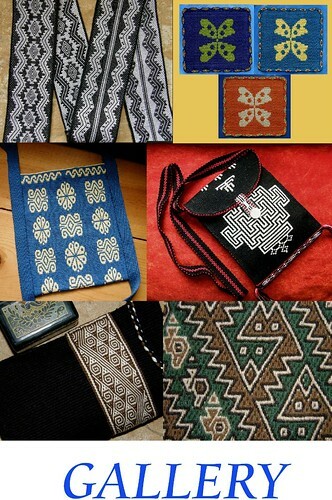 Your newest design excursions exploring ikat with pebble weave are wonderfully adventurous and inspiring. You may not be hiking as many high peaks as you did when you were younger…but you are channeling that energy into tackling new “mountains” in your weaving as you lead the way into realms of textile artistry where no one has gone before. Bravo! Thanks, Lausanne. You are right. I enjoy traveling but I miss being at my loom when I am away on those trips. So, yes, ideas come and develop while I am on the road and that is a good thing. It often eliminates the need for excessive sampling as I have the time to think things through. 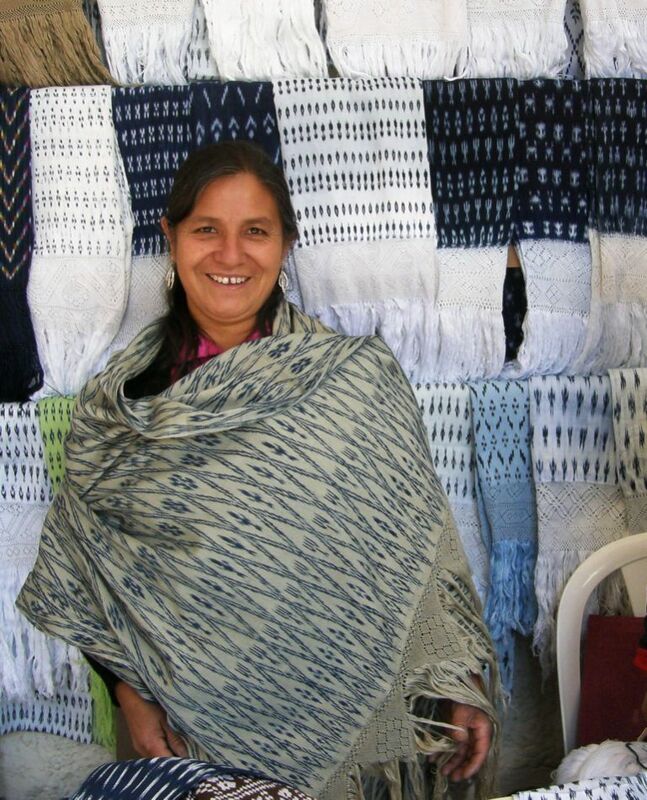 Laverne, I fell totally in love with bacstrap weaving while visiting Guatemala last May. I was supposed to go back in February this year to learn the basics, but am unable to go right now due to a health issue. Planning to try for next year. Wow, just wow, Laverne. As always, thank you for the inspiration! You are one incredibly talented woman. So happy to have met you. Happy New Decade! Thank you so much, Connie. Same to you, Gwen.Looking forward to seeing how your seat cover is going. Your ikat birds are stunning !! !